Pain is part of life. When it comes, how do you handle it? Do you face it head on, completely ignore the pain or sit in it? We all handle pain in different ways. This year my eyes have been opened to the importance of just sitting in the pain. Too often when I face a painful situation, I just want to get through it. I rush the process and try to get to the other side. These past two years God has used pain in a powerful way to teach me so many things. In February of 2015, I had a severe allergic reaction to something I ate. I was covered from head to two in hives for about a week. I had catches in my breathing, swelled up and almost blacked out. After testing, I learned that I am allergic to chicken eggs, wheat (gluten) and dairy. These are foods I can never eat again. My world was rocked and I had to completely change how I ate. Not because I wanted to but because I had to. In May of 2015, I struggled with plantar fasciitis and had to stop running. I also had two eye infections. In June, I sustained a concussion and my nose cartilage was knocked out of place. The fall of 2015 also brought heartache and more pain. Don, my adopted Dad, passed away from cancer. One of my best friends moved away. My nose pain and headaches from my concussion continued. In December, I had strep throat and an allergic reaction to the medicine. At the beginning of this year, I continued to have nose and head pain. My foot pain continued and it was determined I had neuroma in my right foot. More breaks from running. In May of this year, I had surgery on my nose to straighten it back out. It wasn’t until September of this year, that I experienced some relief from my head and nose pain. I don’t tell you all this so that you feel sorry for me. My desire is to testify to God’s faithfulness. I would not be who I am without all I have gone through. As I mentioned earlier, I needed to get to the point where I just sat with my pain especially since I felt exhausted from fighting. When I surrendered and let God use all the situations of the past two years, I was able to really grow. I love this quote from the book called Starry Eyed by Mandy Arioto: “I am learning the best way to navigate pain is to sit with it, to move with it, and let it do its work. Instead of fighting against it, sometimes the most productive posture is surrender.” The posture of surrender. My prayer is that I will continually be in this posture. I share this all with you so you know you are not alone. Each of you has something in life you are facing. It may seem some days like you can’t take another step or that you don’t even want to get out of bed. The only way we can is with Jesus. Each day we need to surrender whatever we are going through. God promised to work everything out for our good. Yes, we may not see it this side of heaven but we can choose to trust God no matter what. 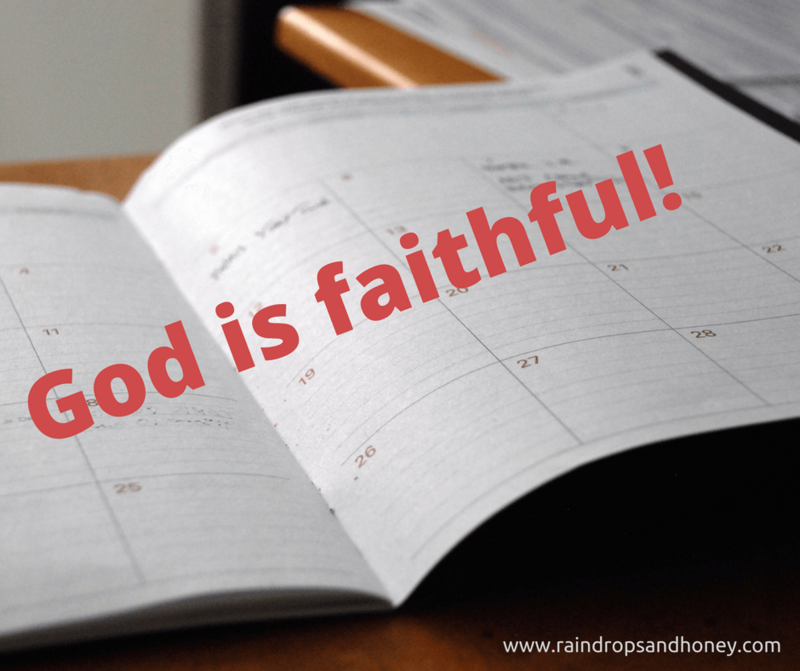 As we look at the calendars of our life, we can write all over about God’s faithfulness. Life on earth is hard. Jesus didn’t promise it would be easy but He did promise He would be with us every step of the way. Will you sit in your pain and let God teach you? Will you let God use your hard times for something beautiful?